There’s an old show-business saying that it isn’t smart to work with kids or dogs, because they steal every scene they’re in. Whoever coined that phrase never shared the screen with Foghorn Leghorn, or he would have included roosters in that warning! Foghorn Leghorn is certainly the most bombastic figure ever to grace a barnyard. Some people think he was a spin-off of the famous Senator Claghorn character on Fred Allen’s popular radio show (where he was played by Kenny Delmar), but in fact, cartoon director Robert McKimson, who guided Foghorn Leghorn’s career, traced his origins to an earlier sheriff character on the radio show Blue Monday Jamboree. Whatever the case, it wasn’t only Foghorn Leghorn’s voice—performed by the great Mel Blanc—that made him funny. He moves funny and acts funny, too. And he became an instant star when he stole the show from Henery Hawk in his very first film, Walky Talky Hawky. From that point on there was no stopping him in his endless torture of the barnyard dog, his pointless lecturing of pint-sized Henery, or his efforts to duck the Cupid’s bow of Miss Prissy. 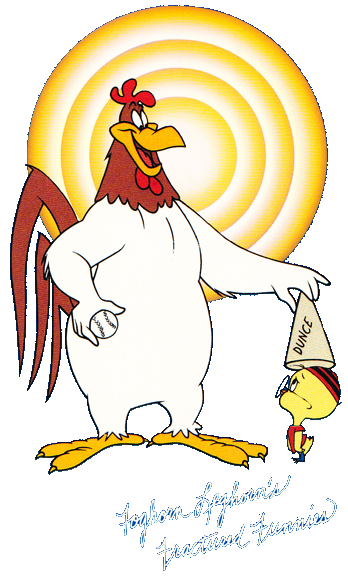 The Foghorn Leghorn officially “introduces” his character, but other cartoons on this video compilation show our Southern-fried hero in his prime—with Leghorn Swoggled and A Fractured Leghorn among the highlights. Foghorn Leghorn is a funny guy—I say, he’s a funny guy—and if you don’t—that is, if you don’t believe me, just watch this tape. And pay attention, son!